Festival Passes and concert tickets are now on sale for the 13th edition of the SweetWater Music Festival (September 16 to 18). The Early Bird Festival Pass price of $105 ends on July 31 (regular pass price $120). The Early Bird price offers a $30 saving compared to buying individual tickets to each of the four concerts. Passes and tickets can be purchased online CLICK HERE and at the Roxy Theatre Box Office (call 519 371 2833). The Friday Night Gala is $45 and other concerts are $30 each. Student tickets are $10 for all concerts. Sweetwater 2016 will offer up an entirely new take on classical and jazz music performed by some of the world’s best musicians. Artistic Director Mark Fewer is bringing together a stellar line up of outstanding performers including Aiyun Huang, The Gryphon Trio, Matthius Maute, Meredith Hall, and James Campbell. Highlights of this year’s Festival include Brave New World on Saturday afternoon. It features Aiyun Huang’s kung fu percussion/video mash up. Her percussion performance of a Sean Griffin composition will be paired with scenes from a 1970s Kung Fu films projected behind her. On Saturday night, David Braid’s new composition will premiere at the Roxy. The work will showcase several local singers along with guest soprano Meredith Hall. SweetWater also has several events open to all on Saturday at Owen Sound’s Harmony Centre including the Classical Jam. Mozart for Munchkins, and Luthier Exhibit. 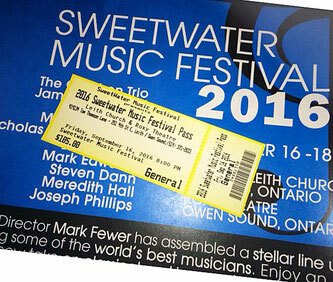 The SweetWater Music Festival is supported by Canadian Heritage and the Ontario Arts Council. SweetWater 2016 is also sponsored by the Community Foundation Grey Bruce and the Eva Leflar Foundation. Municipality of Meaford, and Official Radio Sponsor is The New Classical 102.9FM.